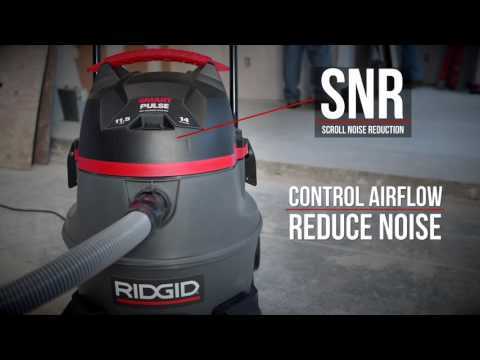 The RIDGID® Model RV3410 professional wet dry vac is a 14-gallon, 2-stage industrial wet dry vac with built in Smart Pulse™ self-cleaning technology to clean the dual PTFE filters. This reduces face-loading and clogged filters making it the ultimate vac for the pickup of fine dust and powders. The dual blower wheel is driven by the 11.5 amp motor and is designed to deliver powerful high-lift suction, large capacity, rugged construction, and excellent mobility for pro, contractor, industrial and commercial use. 11.5 Amp Motor - Drives two blower wheels to optimize suction and deliver industry-leading performance. Longer Motor Life - Over 700 hours on average. 2-Stage Motor - Creates powerful “high-lift” suction and more efficient air flow. Result – more suction power and quieter operation. Cord-Wrap/Large Handle - Large carry handle provides an area for the storage of the 25’ power cord. Premium Locking Pro Hose - The ultra-flexible hose won’t pull loose during use, and is 4x more durable than our standard hose. This 1 7/8” x 15’ hose has a smooth interior surface to reduce clogging. Includes - Vacuum, owner's manual, 2 PTFE coated filters, and 17/8” x 15’ locking hose, and diffuser. 14 Gallon Smart Pulse™ Wet/Dry Vac is rated 3.5 out of 5 by 4. Rated 4 out of 5 by 3ig3addy from Best Vacuum for the Money Every attachment works great. The suction is superb. The only thing that needs improving is the cord storage on the handle. The ears that hold the cord are not long enough to hold all of cord adequately when moving the vacuum around in the shop. There needs to be something to extend them about another 1/2 inch to 3/4 of an inch. Rated 5 out of 5 by Fastback from I have only had it for a shoprt time, and yet it does everything I need in the mest efficient way. This replaces the Craftsman 12 gallon vac I had for 22 years. (Still have the receipt.) In the short time I have had it I have it set up for my table saw, planer and sander. It does a great job. It is easy to pull around and has plenty of suction. Can not beat the warranty. Got it at Home Depo and they have a number of attachments and upgrades that I will likely get in the future. Does the RV3410 meet the new OSHA silica requirements? Hello Bainawe, No, the RV3410 does not meet the OSHA silica requirements. At this time, we don't have a vac that meets the silica dust collection requirement. I am doing a job that involves vacuuming the ceiling pipes and i beams of an industrial building. i need 6 vacs that will operate continuously on two back to back 8 hour shifts. One of your competitors was hones enough to say their best vac needs an hour down time for every two hours of run time. Is that true with these vacs as well? do you have any other recommendations. Hi Ductzguy, We've had customers who call to let us know that they have been using RIDGID vacs to manage flooding in their basement all through the night. This is a testimony of RIDGID's durability. For your specific application, let me share some insights. The vacuum should NOT be left running unattended. Generally, the machine can run without an issue, unless the hose, filter or vacuum inlet gets blocked. These blockages are what could cause the vacuum to overheat and fail. The 3410RV is equipped with an automatic filter cleaning system which is effective at minimizing filter face loading. Throughout its operation, the control monitors the performance level of the Vac. When a predetermined drop in performance occurs, the filter cleaning cycle is initiated. Once the filters have been cleaned, the machine returns to monitoring mode until the next cleaning is needed. When the cleaning cycle becomes more frequent, or when that cleaning cycle doesn't seem to return to monitoring mode, it may be time to empty the drum and / or manually clean or replace the two filters. For this reason, a person should be operating the machine as it is running and we recommend that it should run at a duty cycle of no greater than 80% per hour.